The one thing that everyone finds irresistible is to hold a baby, even if only for a few moments. Elders are transformed by it. Boys suddenly become tender, and girls motherly. Even small children vie for the privilege of holding the newest arrival in the family. As the little one is passed from one person to the next, faces grow bright with joy. A little baby has the power to light up a room. The Little One we celebrate on Candlemass Day has the power to light up the world: «A light to the revelation of the Gentiles, and the glory of thy people Israel» (Luke 2:32). The little Son of Mary, acknowledges as his own the one who receives him, and on the one who holds him, he confers a new identity: divine sonship. Infant, but the Infant guided the steps of the ancient». Simeon, the image of all that in us has grown old with waiting, carries Mercy in his arms, but Mercy, by the light that shines on his face, guides the old man’s steps. If we would be guided by Mercy, we must first receive the Mercy of God that comes to us in the outstretched arms of a little Child asking only to be held. What Can Bring Us Happiness? The Introit says that Mercy is given us in medio templi, in the midst of the temple. This places the Infant Christ, the human Face of Divine Mercy, at the heart of the feast. All of the other figures in the Gospel are seen in relation to the Child. All of the other figures appear in the light of his face. «What can bring us happiness?» they ask. «The light of thy countenance O Lord, is signed upon us» (Psalm 4:7). «Come ye to him», they say one to another, «and be enlightened»( Psalm 33:6). The infant Christ is placed in our arms that we might gaze upon the human face of Divine Mercy and, in the light of that face, be transformed. In the Gospel for the the feast of Candlemass, Luke 2:22–32, the Holy Ghost has inscribed four enduring images of the monastic life that we, at Silverstream Priory, are striving to emulate. These are images full of freshness, vitality, and hope: the Virgin Mother, Saint Joseph, Saint Simeon, and Saint Anna. Blessed Mary is completely silent in this Gospel. Even when addressed by Simeon, Our Lady remains silent. Her silence is an intensity of listening. She is silent so as to take in Simeon’s song of praise, silent so as to capture his mysterious prophecy and hold it in her heart. She is silent because today her eyes say everything, eyes fixed on the face of the Infant Christ, eyes illumined by the brightness of his appearing. She is the bride of the Canticle of whom it is said, «How beautiful art thou, my love, how beautiful art thou! Thy eyes are doves’ eyes, hid beneath thy veil» (Song of Songs 4:1). Monastic life, at Silverstream Priory and wherever it is found, begins in the silence of Mary and in the light of her eyes, eyes made bright by the contemplation of the Face of Christ. Saint Joseph shares Mary’s silence. Silence is the expression of their communion in a tender and chaste love. Joseph listens with Mary. Saint Joseph is the first to enter the sanctuary of the Virgin’s silence. It is Saint Joseph’s way of loving, his way of trusting his Virgin Bride beyond words. The silence of Saint Joseph becomes for us monks a way of loving, a way of trusting, a way of pushing back the frontiers of hope. Saint Joseph is necessary to the unfolding of the plan of salvation; God willed to have need of him. Saint Joseph’s role, like that of Mary, is not limited by time and space. Saint Joseph, Protector of the Universal Church, stands beside the Mother of the Church today: silent, listening, and tenderly focused on the Face of Christ in the least of his members. Saint Simeon represents the old priesthood disappearing into the light of Christ, our «merciful and faithful high priest before God» (Hebrews 2:17). Simeon is the old priest pointing to the new. He speaks; he sings his praise; he utters prophecy. In this Saint Simeon models the vocation of every priest called to instruct, to lift his voice in the Great Thanksgiving of the Holy Sacrifice, and to deliver the message of God in the power of the Holy Ghost. Saint Simeon had a particular relationship with the Holy Ghost. Three times in as many verses Saint Luke emphasizes the mystical synergy (working–together) of Simeon and the Holy Ghost: «And the Holy Ghost was in him» (Luke 2:25); «And he had received an answer from the Holy Ghost» (Luke 2:26); «And he came by the Spirit into the temple» (Luke 2:27). In Saint Simeon, we Benedictine monks have a model of «life in the Holy Ghost». We today, like Simeon of old, are called to contemplate the Face of the Infant Christ and to raise our voices in thanksgiving for the consolation of all believers. Finally, there is Saint Anna the prophetess. Anna is the daughter of Phanuel, whose name means «Face of God». Anna has made the temple her home. Abiding day and night in adoration, she emerges from the recesses of the temple only to give thanks to God and speak of the Child. Drawn into the light of the Face of Christ, Anna cannot but praise God and publish the good news «to all who were looking for the redemption of Jerusalem» (Luke 2:38). In some way, Anna of the Face of God is the first apostle sent out by the the Holy Ghost. Before Mary Magdalene and before the twelve Apostles, Anna announces Christ. She is compelled to speak but does so out of an “adoring silence.” She emerges from her cloister of perpetual adoration in the temple to publish the long-awaited arrival of Mercy with the light of his Face shining in her eyes. Jesus Christ, Mercy–in–the–Flesh, allowed himself to be passed from the arms of the Virgin Mary and Saint Joseph into the arms of Simeon and, then, undoubtedly into the embrace of holy Anna. The festival of the Purification of the Blessed Virgin Mary celebrates the descent of Mercy, the reception of Mercy, and the exchange of Mercy. Mercy given from on high, Mercy embraced in the midst of the Church, Mercy exchanged among us. 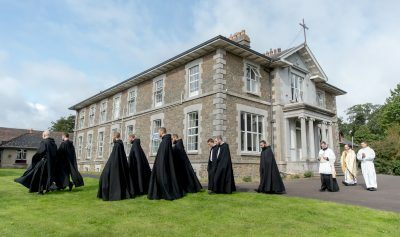 Benedictine life at Silverstream Priory is just that. “O God, we have received thy Mercy, in the midst of thy temple” (Psalm 47:10). And we, Benedictines of Silverstream repeat today what our father Saint Benedict says to us in Chapter IV of his Holy Rule: «Never to despair of the mercy of God».